I love gyoza! These dumplings were actually influenced by the Chinese, where they are more popularly known as potstickers. The main difference between potstickers and gyozas lie in the wrap; potsticker wrappers are thicker, while gyoza wraps are thinner and almost translucent. The Chinese get credit for the invention of this little dumpling which is essentially the same as the Chinese Jiaozi. The gyoza was not introduced to Japan until the 1940’s most likely adapted after the Japanese invasion of China in the late 1930’s. Since then the Gyoza has become so popularized that there are Gyoza restaurants and even a Gyoza Stadium located in Osaka, Japan. The Gyoza Stadium has a museum complete with history and explanations of the many varieties of this adopted dish. 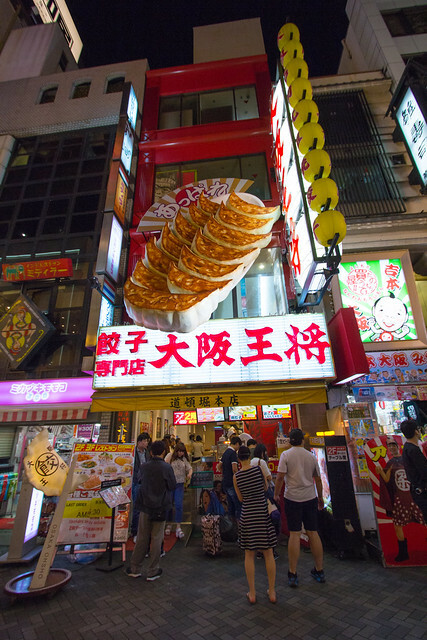 We went to a popular gyoza shop in Dōtonbori, that can’t be missed from its display of a stacks of gyoza hanging above the storefront, and a gyoza held by an enormous chopstick! The sister and I got a tray of 5 yaki gyoza for ¥200. There was a big bowl of sauce to scoop onto the gyoza. Yum! There are actually different types of gyoza; the one I had was yaki gyoza, which means fried gyoza. The bottom of the gyoza is pan-fried and crispy, making the gyoza soft and delicious when eaten! Yaki gyoza are by far the most common type of gyoza. They are pan fried in a hot skillet before a mixture of water and cornstarch is poured in and everything is covered for a few minutes. The water and cornstarch mixture helps to steam the gyoza, making them soft and juicy while creating a thin crispy bottom on the individual gyoza. 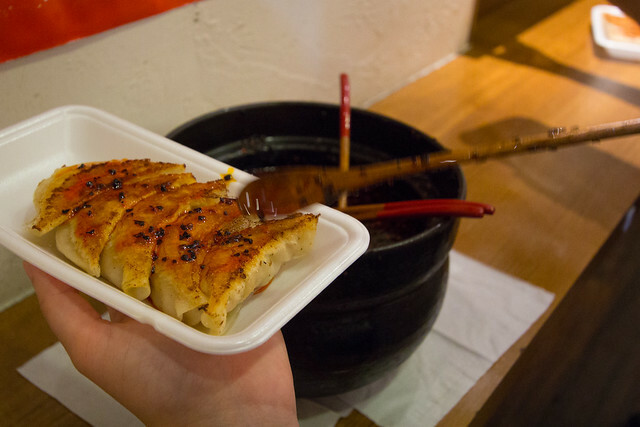 Yaki gyoza are typically served with the crispy bottom side up. Hanetsuki gyoza (“gyoza with wings”) is the term used when the individual gyoza pieces are all connected by the thin crispy bottom. Gyoza is a popular food snack in Osaka. I’ll have to try other variations next time I visit the city! And maybe visit the gyoza museum in Gyoza Stadium! Osaka Ohsho, the world’s No. 1 restaurant specializing in these Japanese-style dumplings. Trust Osaka Ohsho who’s been doing gyozas since 1969 when Shinzo Fumino opened his first ever store in Osaka on a narrow alley near the Kyobashi train station. It was a humble little store with no tables, just counters. There, Shinzo sold his precious handmade gyoza for 50 yen each, together with some ramen and fried rice. To advertise his store, he gave out free gyoza coupons to students in the area who helped him spread the news about his store to their friends and families. 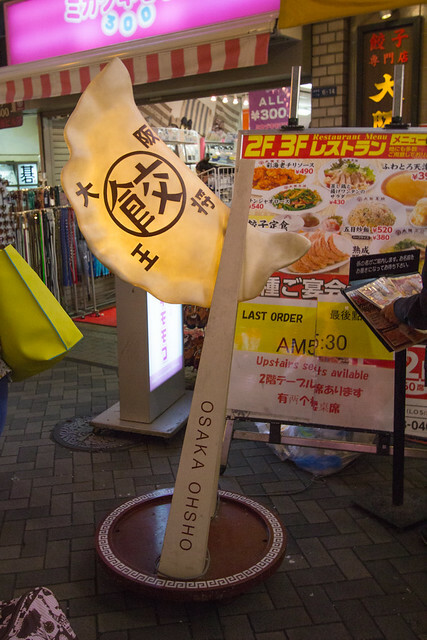 By word of mouth (contented mouths, I’m sure), Osaka Ohsho soon became a household name. Barely a year after Shinzo opened his first resto, his friends partnered with him to expand his business. Together with the investors, he established the Osaka Ohsho Foods Co. Ltd. with a capital of two million Japanese yen. One hundred stores later, in 1982, new items were introduced on the menu. But of course, the gyoza still reigned supreme, with 6,000 pieces sold daily in one store alone.